Key stakeholders raised their sledgehammers to inaugurate construction of a new healing centre for children Nov. 28th. “I’m really excited about what this [centre] is going to do for our community and for our children,” said Barb Barber, executive director of The Outreach Centre. The demolition ceremony, hosted by the main construction partner Alair Homes, was held at the future location of the Dragon Fly Centre right across the parking lot from The Outreach Centre’s main location. Alair Homes and other local businesses are coming along side the centre to help offset the costs of building the new site. The market budget for construction and the build of the Dragon Fly Centre are an estimated $420,000. So far, The Outreach Centre has secured about $260,000. “So, we still have a little ways to go, but I’m confident that we’ll get there,” said Barber. 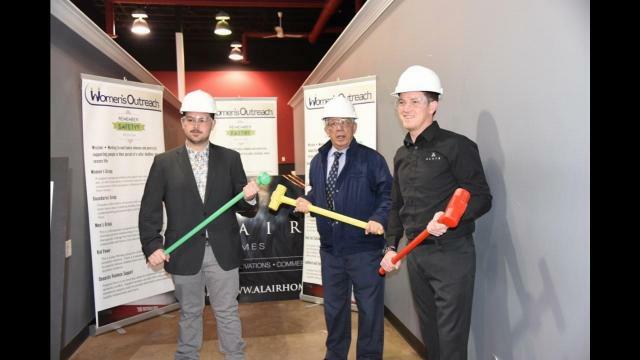 Dustin Marsh, a partner with Alair Homes, said his company’s history with The Outreach Centre over the years made it easy to get excited about the project. “When this opportunity came up it became fitting, because we understand the purpose behind this centre, Barb’s passion behind it, the stories that go with it and the benefits of what the centre is going to do,” he said. Other construction donors include Lindsey Johnson Design Co., Wendi Ronspies Design Inc., Red Hot Chilli Painters, Red Deer Lighting, Postma Electrical Services, Windsor Plywood, Emco Supply Red Deer and Wolf Creek Building Supplies. The Dragon Fly will be a healing centre for children who have experienced trauma due to domestic violence, homelessness or losing someone to suicide. The project is both personal and professional for Barber who spoke of losing a colleague who had experienced a significant amount of childhood trauma. She said she couldn’t help but wonder how different the trajectory of that person’s life might have been if they’d had access to a facility like this. Barber said that the centre will enable The Outreach Centre to intervene and provide supports at early stages. “The trauma they carry, if left unhealed, can really affect them in later life and into adulthood, and we’re really hoping to make that difference for them and to change their path,” she said. She hopes to move programs into the Dragon Fly Centre by the beginning of April.